Today I attempted to fit my new ‘Magic Hob Liners’, but found they were too small for my range cooker. I rang Lakeland and offered to return them for a refund, but the woman I spoke to said that sounded like a long way for me to travel and simply refunded my card immediately. She didn’t even want the hob liners back, and suggested that I should give them to a friend or to a charity shop! In these days when we’re all watching the pennies, this sort of stellar customer service is particularly welcome and appreciated. Well done, and thank you, Lakeland! 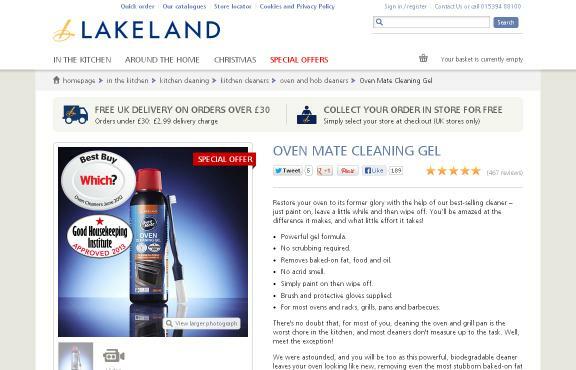 Also, and while I’m at it, if there’s anybody else out there who hasn’t cleaned their oven for two years but hates the nasty, pongy oven-cleaning products available in supermarkets, I’d highly recommend Lakeland’s ‘Oven Mate Cleaning Gel‘, which I bought about 6 months ago and finally got round to using a couple of weekends ago. Absolutely brilliant! I left it on overnight and wiped it off in the morning. Almost every bit of nasty brown gunk came away, and now I no longer get nasty burning smells when I’m cooking something hot in my oven. And, true to their promise, there was no smell. I even used it on the oven racks, and now they’re sparkling like new. I’m not very good at the old household maintenance stuff, and so products that really do the business without unnecessary fuss or mess are very much appreciated Chez Peewiglet. Lakeland tends to be where I look first, and now I’ve been reminded of exactly why that is. This entry was posted on Sunday, October 13th, 2013 at 4:14 pm and is filed under Uncategorized. You can follow any responses to this entry through the RSS 2.0 feed. You can leave a response, or trackback from your own site.